The picture is from a drawing by W.E.Cooke, circa 1880. 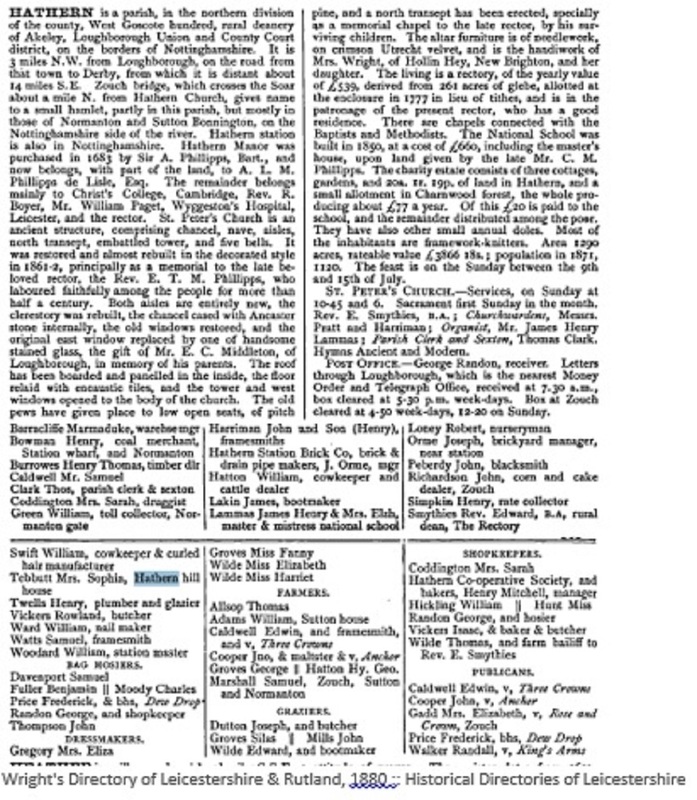 It is followed by a feature article in a local newspaper of the time. Alighting this pleasant afternoon at Hathern railway station, the scene that presents itself is one of characteristic English beauty. The merrie month of May has reached its closing days, and bright June is ready to burst upon us with " all its smiling hours, with songs of birds, and stir of leaves and wings." " Standing with reluctant feet " where young spring and "jolly summer" meet, Nature wears the full aspect of progress and transition. The sun shines with noontide splendour from a cloudless sky, and the ardour of its rays is only slightly cooled by a welcome breeze that ever and anon sweeps across the vale. Though every field and tree and hedge stands out sharply defined beneath the May gun, an oppressive and almost unbroken silence reigns supreme. Indeed, save for the occasional rush of a passing express, the desultory chirp of some unseen bird, the lumbering noise of a cumbrous waggon on the highway beyond, or the characteristic sound of some agricultural machine in an adjoining field, it seems as if drowsy Nature had sunk to sleep under the fervent beams of the orb of day. However, though the melody of birds is hushed, the scene is one of no ordinary charms. For the foreground we have the fertile Soar valley, with its hedge-framed fields of green, yellow, and dark brown, dotted here and there with browsing cattle, and trees in all the glory of full blossom ; the village of Hathern is seen nestling on the rising ground beyond, while stretching away in the distance loom the picturesque outlines of the Charnwood hills. To the left, a little Loughborough-wards, the spire of Normanton Church peeps picturesquely above the trees amid which it is so deeply and charmingly embowered. Away to the right the spires of other churches rise heavenward, relieved here and there by an imposing hall, or some less commanding country residence. Leaving the station, and striking down the highway across the valley, we are at once reminded of the low-lying character of the whole district. Along one side we have the elevated plank footpath with its handrail, and at intervals a figured post that is intended to mark the depth of the invading waters in times of flood. Judging from the height to which these are carried, the rains must at times convert the whole valley into a vast inland lake, even if they do not entirely cut off the village from its railway station. About midway we reach the Soar, which here divides the counties of Leicester and Nottingham, and which is here spanned in one graceful sweep by Zouch Bridge. " 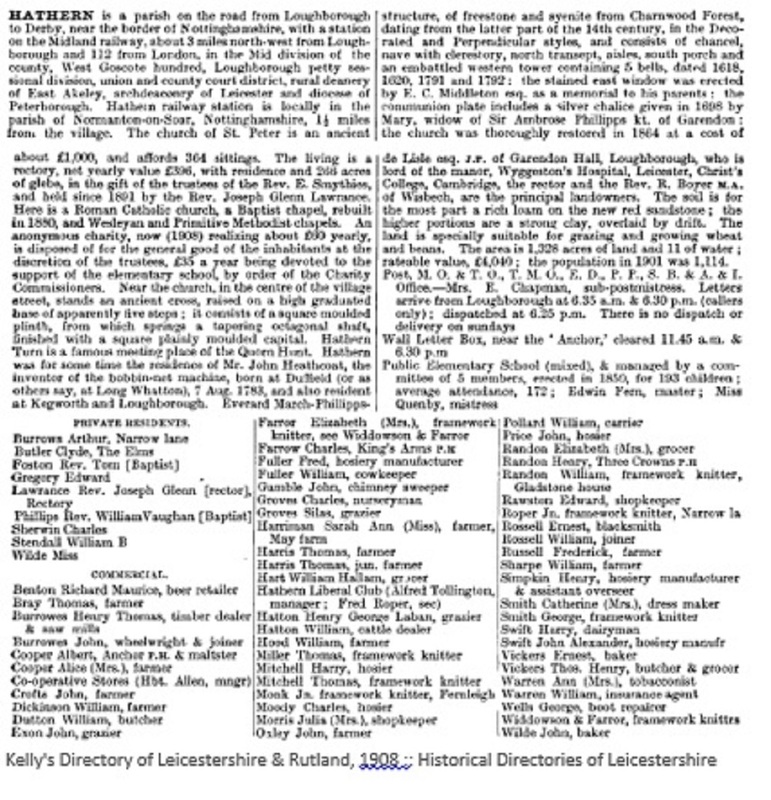 Sotch" —as it is familiarly termed by the natives — is a village, partly in the parish of Hathern, but mainly in those of Normanton and Sutton Bonington. The only object of interest here it a large flour mill, and the hamlet appears to be chiefly populated by its employees. Passing on, and ascending the opposite tide of Soar valley, we soon reach our destination— Hathern. According to the last census, this village was inhabited by 1313 individuals, showing an increase during the decade of precisely 199. Taking into consideration the fact that in other villages the tendency is to depopulation and an exodus to the town, this can only be regarded as doubly satisfactory. Moreover, the sexes appear to form a reversal of the ordinary rule, the females, instead of showing the usual preponderance, being in a minority of 645 to 668. These represent 310 separate families ; while the habitations have risen from 282 to 296. Wandering through its meandering and crooked thoroughfares, one cannot but be struck by the large, quaint, and old-fashioned domiciles that line its streets. Here the timber-built dwellings come out in strong force. Upon the age of this form it ie difficult to speculate. It is true some have been in use from the earliest times down to the present ; but it is supposed, from the perishable character of the material, none take us further back than the thirteenth century — and even these are said to lie few and far between, King Richard 's House in Leicester, a unique and interesting specimen, dating as late as 1450. The common practice in these cases was to construct the skeleton of timber and fill in the interstices with brick or plasterwork. But in Hathern of course this does not stand, alone. The vast majority of the houses belong to a bygone generation ; but these are gradually being Ieavened by the improved architecture of to-day. Blocks of good modem cottages are to be seen here and there. On the whole, however, these only by contrast conclusively prove the claim of Hathern to be considered an ancient village. Near the centre stands the original village cross. Remembering that this has not only been mutilated by the Roundheads, but withstood the fury of the elements for so many centuries, its condition of comparative preservation is remarkable. Few who daily pass this weather-worn and broken relic ever imagine that it is the dilapidated memorial of an ancient custom, by which this sacred emblem gained an honoured place in our cemeteries, by the roadside, and in the market-places and open spaces of England. Upon another point the visitor will have little difficulty in arriving at an accurate conclusion— and that is with respect to the staple industry of the village. On entering he will be greeted with a characteristic whirr from one workshop after another, and as he penetrates farther he will have to run the gauntlet of an increasingly rapid succession poured in upon him from all sides. Should he still remain sceptical, he has only to glance in at almost the first window or open door he meets, and he will there behold the now familiar stocking-frame hard at work. At the last census it was recorded that at least two- thirds of the population were engaged in this handicraft, and the proportion has since been maintained. Observing an experienced and intelligent-looking workman at one of the looms, we stepped in to inquire What was his opinion with reference to the condition of the local trade ? He thought that more were now employed at framework-knitting than had ever before been known in the history of the village. Asked as to his conclusions with respect to the introduction of machinery, his testimony was equally clear. Ignorant and foolish Luddites might regard a new patent as their deadly enemy, and" smash" it accordingly. But this shrewd and thinking knitter look a different view of it. It was admitted that the new machinery might primarily displace workmen in this or that particular branch, but, taken as a whole, its effect was to cheapen production, increase the demand, and thus multiply the number employed. 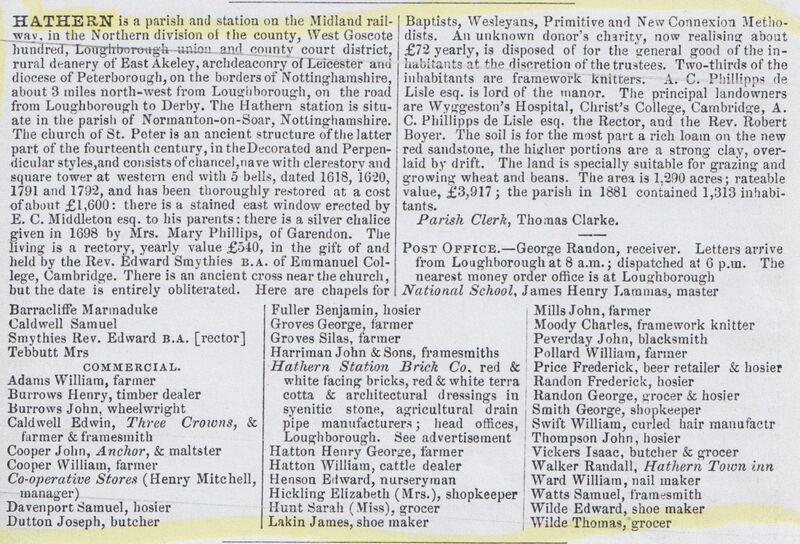 But what was the condition of the hosiery trade in Hathern at the present moment ? The frames were nearly all engaged upon what were known as the old-established Derby ribs. Work had been better two years ago than it was now, and wages had since been reduced twenty-five per cent. Withal, however, said this cheerful artisan. Hathern men now enjoy more than an average proportion of orders, and have no reason to complain. St. Peter's Church was restored and almost rebuilt in 1861-2 at a cost of £1,460, chiefly- as a memorial of the late rector— Rev. E. T. M. Phillips, of whom more anon. It is in the Decorated style, and consists of chancel, north transept, north and south, aisles, and square embattled west tower, containing clock and five bells. The east window is of four lights. These have been filled with stained glass, and represent in succession the Birth, Baptism, Crucifixion, and Ascension. These are surmounted by quatrefoil tracery, filled with sacred emblems, and supported on each side by a crocketed niche This window was presented by the late Mr. E. C. Middle- ton as a memorial of his parents. On the north side there is a piscina and a sedilia. There is also a low side window. The object of this singular provision is by no means clear, a dozen different theories having been submitted upon it. But of these the more probable number two. The first, and more generally accepted, is this - that through this window the leprous, sick, and excommunicated without were enabled to receive the Host from the priest's hand, as lie passed towards the altar. The second is this — that they were used for placing a light in that could be clearly seen without -hence the lychnoscape. The side windows here have been judiciously restored ; the chancel cased with Ancaster stone, and the floors throughout laid with encaustic tiles. The altar furnishing is in needlework, upon crimson Utrecht velvet, and was the handiwork of a New Brighton lady and her daughter. The north transept or chapel is a neat structure, entered between clustered pillars, supporting a pointed arch, and lighted by a three-light flamboyant window. An inscription upon the exterior tells us that the transept was erected by his surviving children as a memorial to the late rector. Then follows the testimony that "in the discharge of his pastoral duties he was a faithful and unwearied steward, and that during a long course of years he sustained by character as well as precept the character of a humble follower of the Lord Jesus Christ." The clerestory has been restored and filled with Decorated windows, while the north and south aisles have been replaced from the foundation At one time the tower and west window were blocked up by a gallery, from which the service of praise was led by a clarionet. But this has now been swept away, and an improvement has been effected which has added considerably to the aspect of the interior. Occasionally the bells have some quaint or singular inscription, but in the case of St. Peter's they bear little beyond the mere record of names. As far back as 1552, however, the village could boast of its " three belles." In the nave the old-fashioned box pews have given place to open and varnished pitch-pine seats. The pulpit is an admirable design in stone, with marble pillars, and the font octagonal The living is valued, according to a recent Kalendar, at £529, and is supplemented fey a large and commodious rectory. It is held by the Rev. 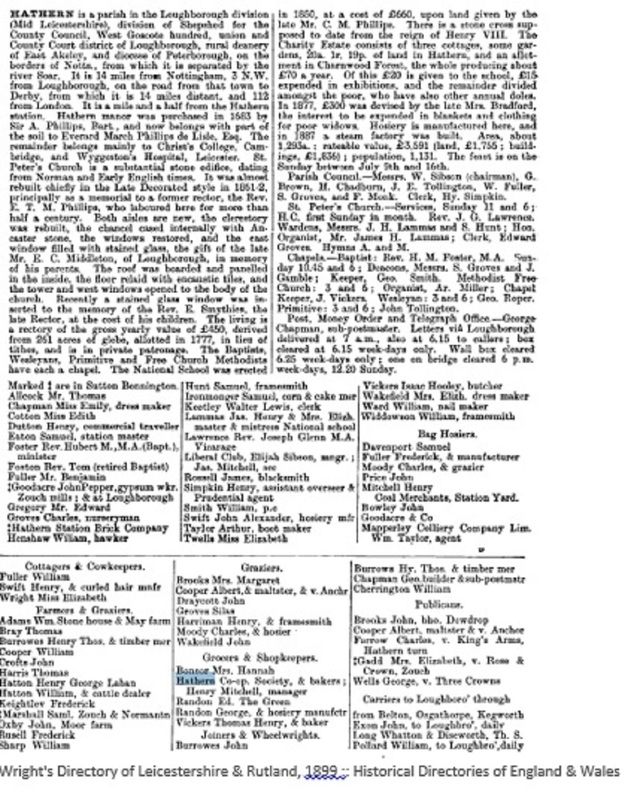 E. Smythies, B.A., who was instituted in 1859, and who is likewise the patron. Nor are Nonconformists inadequately provided for. Indeed, with the large industrial population in the village, the Dissenters probably represent the great majority of the population. Be that as it may, they possess no fewer than four chapels. Of the Nonconformist churches the Wesleyan seems to be the oldest. Their present chapel bears date 1864 ; but from the fact that Nichols refers to the existence of a " Methodist meeting-house," they may safely be said to date from at least the last quarter of the last century. At first they doubtless experienced all the usual discomforts of meeting in a private house ; but as time passed they were enabled to assemble in a rude and primitive hall which still exists, and which has since come into the possession of the local temperance society. Their present chapel is a commodious little structure, seated with neat open benches, and wearing a light and tasteful aspect. Only second in point of age rank the General Baptists. Their first service is believed to have been held in 1814, when the local members of the denomination were joined by a few old people from neighbouring churches. Three other places were subsequently fitted up for worship. In 1840 a church was formed, and in 1849 this was provided with a suitable home in a newly-built chapel. In May last the work of rebuilding was completed. With its arched doorway and pointed windows, the frontage has a pleasing effect ; beneath are the memorial stones respectively laid by Mr. T. Wilde, the senior deacon, Miss Coddington, Mr. B. Baldwin, and Mr. T. Fuller, school superintendent. The interior is fitted with open benches to accommodate about 300 ; has a handsome rostrum, and a choir gallery. Adjoining is the Sunday School, with its class rooms above and below, the upper one being provided with a moveable partition by which it can be opened into the chapel. The school itself was established in 1835, and has now about 130 upon its books. The Wesleyan Reform Chapel abuts upon the principal thoroughfare, opposite the parish church, bears date 1863, and was erected at a cost of £160. The " cause," however, had actually been founded some — if not many — years before. The only other Nonconformist Church is the Primitive Methodist. Their first chapel was formed of two cottages; thence they betook themselves to a school which had been utilised by the General Baptists. Here they worshipped for a few years until they gathered sufficient strength to build their present chapel. This was opened in 1852, and will accommodate about 150. The church forms part of and is supplied by the Loughborough circuit. While religious teaching is thus amply provided for, elementary education is not neglected. 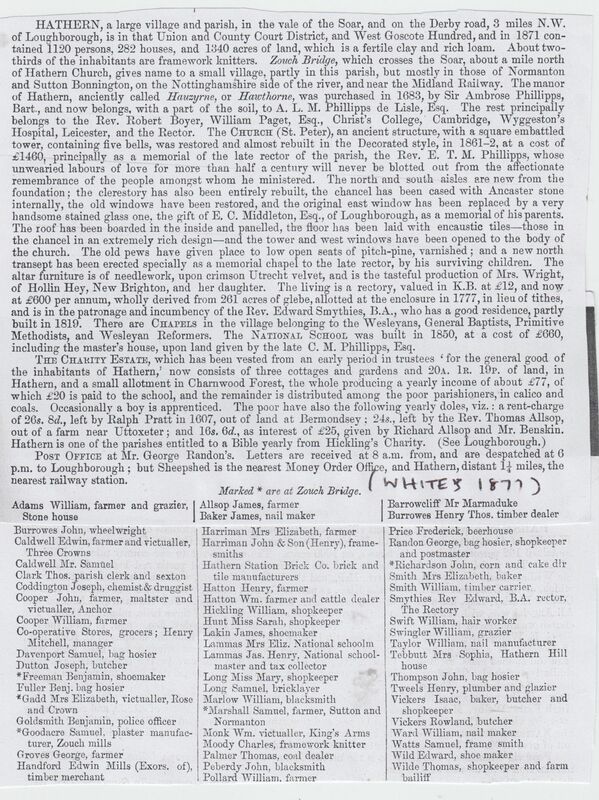 Under an old " unknown donor's" charity, £5 was long annually paid to "a master of a school in the parish for instructing in writing ten poor boys, selected by trustees," and it is evident, therefore, that educational provision has existed from very early times. At present this is solely represented by the National School, which was built in 1850, at a cost of £600, including the master's house, upon land given by the late Mr. C. M. Phillips. Mr. Lammas, the head teacher, has held the office for about fifteen years. During that time the attendance has increased from 100 to about 220, while the Government grant has risen from £30 to £140, the passes under inspection being about 90 per cent. Complaint, however, is made of the irregularity of attendance. This is more especially the case upon Fridays, when the number detained at home, in connection with the extra pressure in the hosiery industry, is so large that it is said to be hardly worthwhile to keep the school open. It is true that an attendance officer, acting under the Union Committee, does his best ; but it is held that compulsion will be only partially effective until it becomes still more direct and prosecutions more economical. Hathern has various other institutions, all more or less praiseworthy. First and foremost may be noted its co-operative store and bakery, which is really one of the largest buildings in the village. 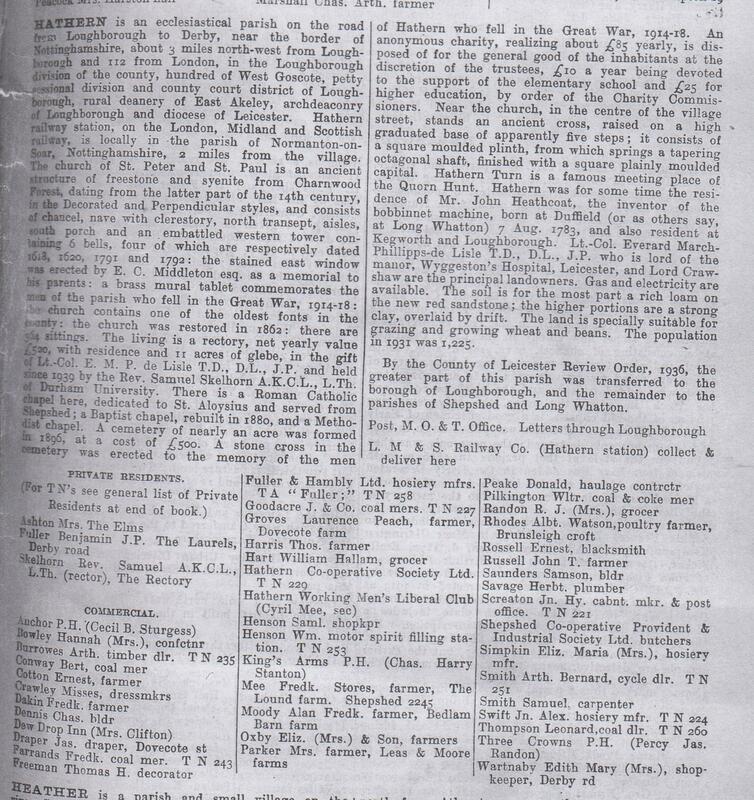 From its last, or thirty-fifth, quarterly report, we find that its members number 154, and that the members' capital, with dividend and interest, amounts to £1,192 : funds in penny bank, £174, and its loan capital £405. Upon property account it has expended over £1,100. During the past quarter its receipts amounted to £1,200. This left a nett profit of about £90 ; out of this the members received a dividend of 2s. in the pound on all purchases, and non-members one of Is., and this left an un- disposed of balance of £15 to be carried for- ward. 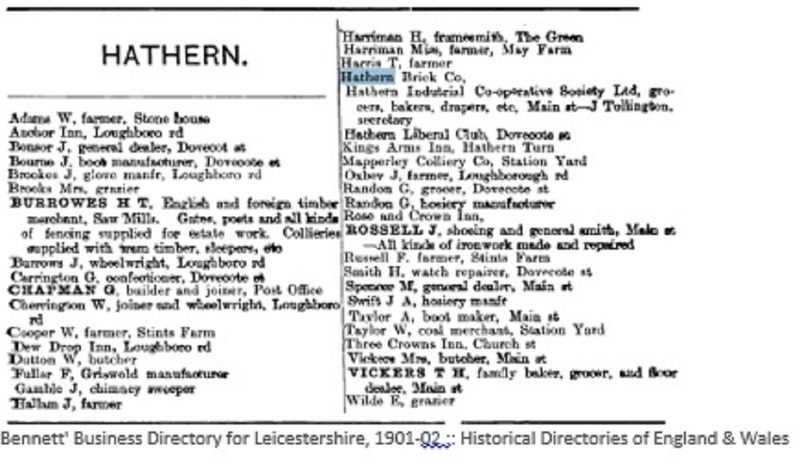 Hathern has also its Floral, Horticultural, and Celery Society, with its annual exhibition, and a Temperance Society, which was established in 1854, and which has recently been revived. Of Friendly societies it has several ; one of these, the new Sick Club, has been established about 34 years, and has about 200 members. 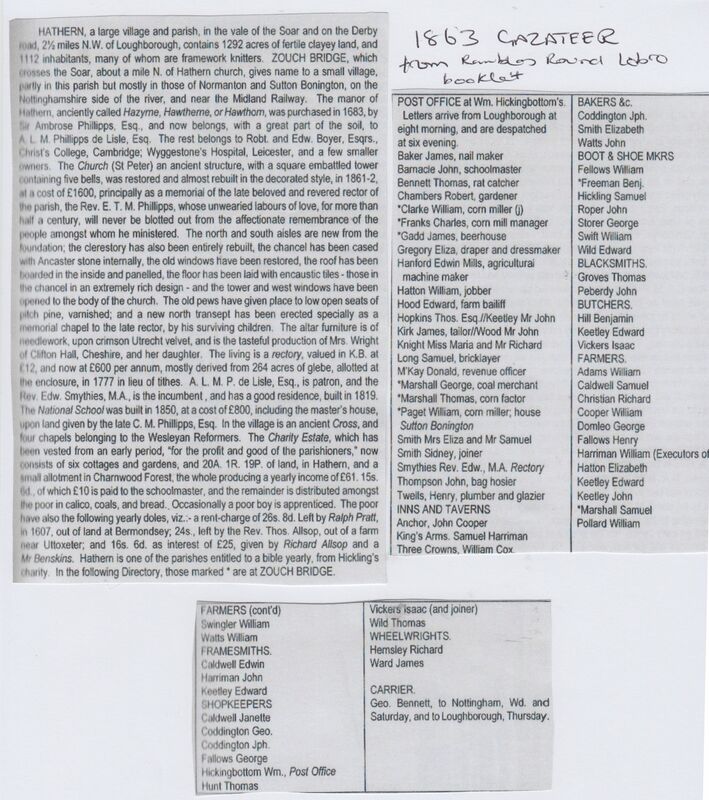 Another, the Equitable Friendly Society, has a. capital of about £900 invested in land, which is let out in allotments. A third is a lodge of Foresters, entitled "The Marquis of Hastings " ; while a fourth is the old Sick Club, which is probably the most venerable of all, and which has a membership of over 200. 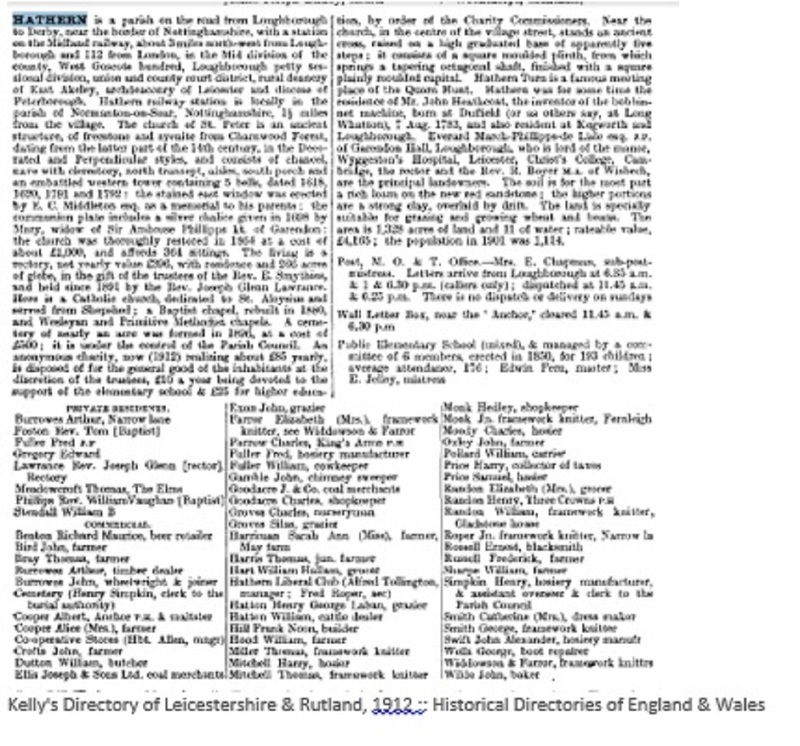 Of charities Hathern has also its share. The principal is some property and land which now produce a yearly income of £77. 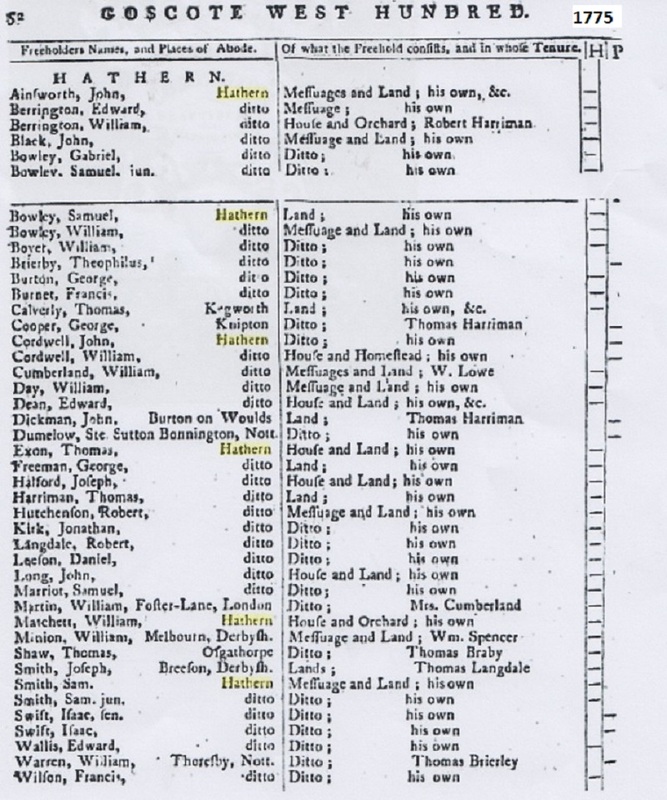 From 1717 to 1808 this benefaction was devoted exclusively to the repair of the parish church ; but subsequently, upon opinion of counsel, it was directed "that the" rents and profits should be employed for the common profit and good of all the parishioners and inhabitants of the town of Hatherne." 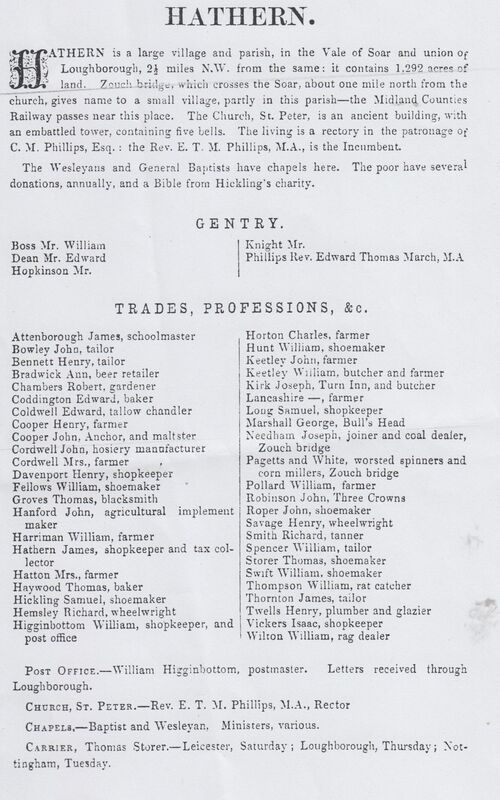 Of the proceeds, £20 is now handed over to the school, while the remainder — with the exception of the occasional apprenticing of a poor boy— is devoted to the purchase of calico for distribution among the necessitous inhabitants. There are four other charities ; but they are mere doles for the poor, amounting in the aggregate to about £3. 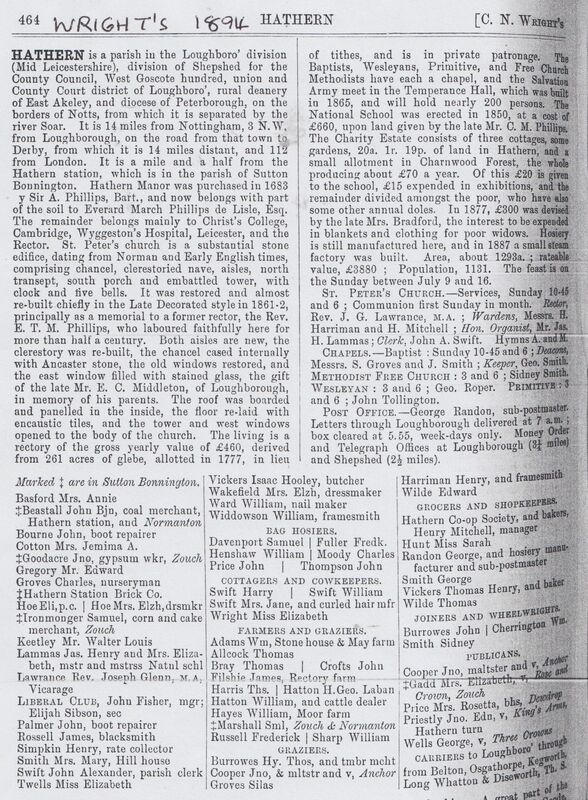 In the case of Allsop's Charity, it is noted that the value of loaves directed to be distributed exceeds the amount left for the purchase of them, and the deficiency was originally made up from the poor rates. It was also prescribed that the kind used should be "bolted bread." 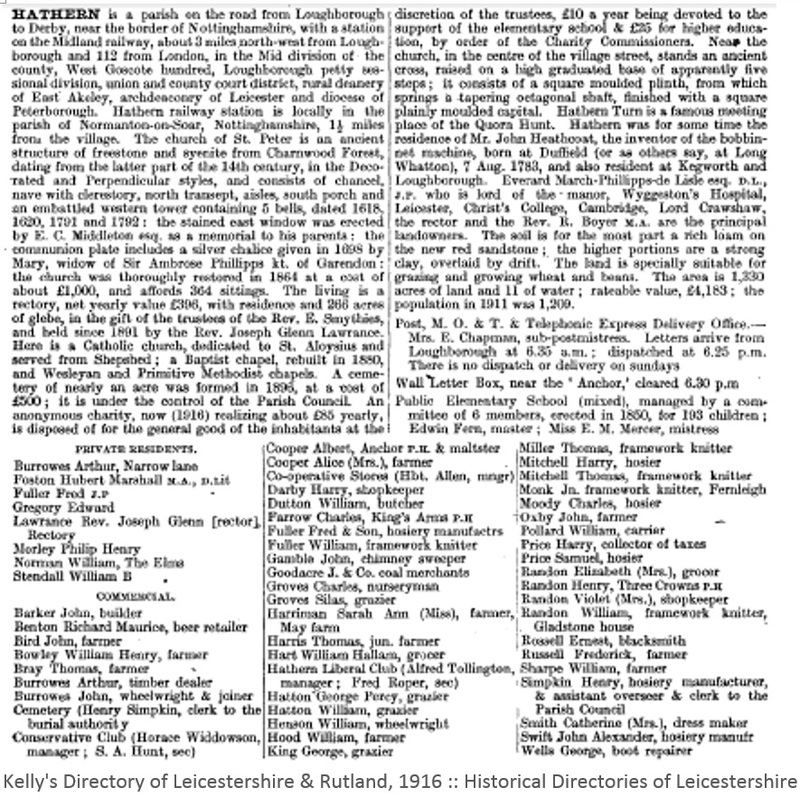 Hathern is associated with one or two illustrious names that have taken their place in history—including that of Aylmer. But one cannot wander through its streets to-day without realising that there is, after all, one with which it is destined to be more inseparably associated than another. Need we say that it is the still treasured and venerated name of Edward Thomas March Phillipps, the late rector ? 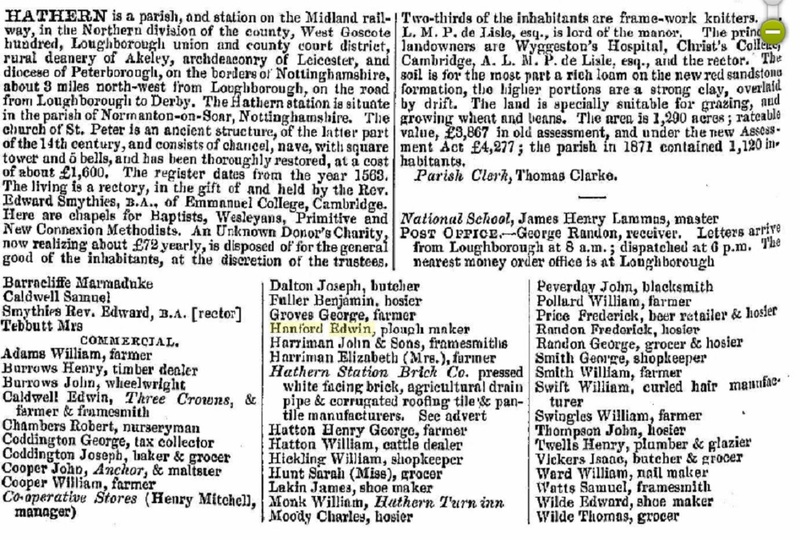 Born in 1784, he was the son of Thomas March Phillipps, of Garendon Park, the great grandfather of the present owner. 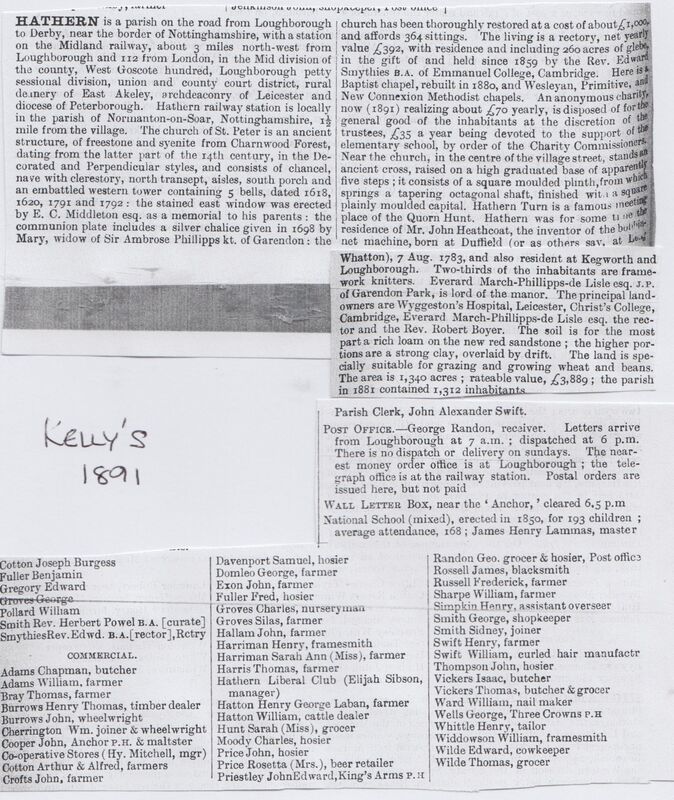 At the early age of nineteen he took his degree as sixth Wrangler, and in October, 1808, he entered upon his ordained sphere of labour as rector of Hathern. The state of the village when he entered upon his life-long work was by no means satisfactory. His daughter, in her admirable "Records "of his ministry, tells us that "the north side of the churchyard was the usual place for celebrating all the fights that took place, and a recess that lay between the north aisle and the vestry was used for fives and skittles.'' Nor was this all. At the first marriage Mr. Phillips solemnized, we are told, " the crowd began to amuse themselves while the service was going on in the chancel, by pelting each other with prayer books and basses in the church, and one bass thrown by a bolder hand fell between the couple and fell within the rails." The rev. gentleman thereupon stopped the service and ordered the church to be cleared, and the crowd eventually clustered round the windows " hooting and veiling defiance." As for the orchard and garden robbing, we learn that this " had become so common amongst the apprentices and journeymen, that nothing was safe in either, and this sort of property was absolutely useless. But Mr. Phillipps soon changed all that, and this and other forms of dishonesty became as rare as they had previously been prevalent. His first care was to provide efficient Sunday Schools, and supplement these by a night school and library, and by these and many other agencies a marked improvement became visible. 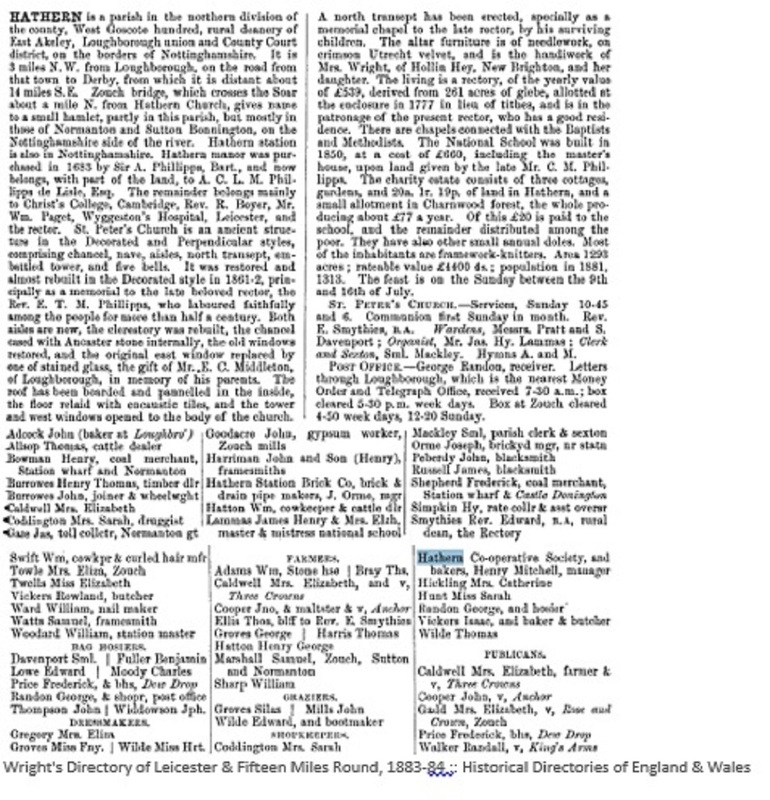 He was an indefatigable worker on behalf of the British and Foreign Bible Society, and, assisted by a committee of Churchmen, Methodists, and Baptists, maintained the constant superintendence of a parochial Bible Association. As for his attitude towards Dissenters, his own language upon the subject will be sufficient : — "l have never made any effort to proselytize, for I should at no time have regarded it as the slightest advantage to have made out of a mere Baptist, or Methodist, or Ranter, a mere Churchman." He added : "Those who have departed from our body, the bitterest amongst them, well know that they have never sought my aid and been refused, whether it was in the way of medical advice, or ministerial advice, or temporal supply. Whether the people were dissenters or not, the population of this place was the flock committed to my care." Mr. Phillips had studied medicine in order to qualify himself to give such advice, and the services which it subsequently enabled him to confer upon the villagers were simply incalculable. When we turn to his secular work, it was as comprehensive as it was thorough. Mr. Phillipps deeply Interested himself apparently in all that interested his parishioners, and regarded as included in his pastoral work everything that could in any degree tend to promote the welfare and progress of his people. About 1848 he became a victim of disease of the hip joint, which culminated in dislocation. We are told that "when unable to walk up the steep stairs or ladders of some of the cottages in order to reach the sick man's bedside, he went up on his hands and knees." One who was thus visited remarked that he " could manage it so very nicely but," he added. " it is terrible work to get down again sometimes, I can tell you." Such an incident will speak more for the true character of the late rector than all the eulogium that could be penned. Nor was Hathern alone the object of his care. From 1808 to 1845 he was also minister of Dishley with Thorpe Acre, and in both of these places his work was equally valuable and valued. At Thorpe Acre, in 1845, he completed the erection of a new church, which he lovingly describes as ' ' the prettiest little bijou ever built — all of stone — Derbyshire — decorated Gothic, with a campanile and high roof," while at Hathern he obtained schools and erected a schoolhouse in 1849. But it would be impossible in the brief space at disposal to convey any adequate conception of Mr. Phillipps's lifeand labours during his ministerial career of half a century. Suffice it to say that it was crowded with generous, painstaking, persevering, and unostentatious service — work, the memory of which is destined to remain fragrant and green for generations after the unselfish and devoted labourer has entered into his rest.